Switzer-CARTY is excited to announce that we were successful in the Toronto Student Transportation Group RFP in winning 150 school bus routes effective September 2016 servicing the Toronto Catholic District School Board and the Toronto District School Board. Our service fleet includes 90 18-passenger buses and 60 72-passenger buses out of 3075 Lenworth Drive. At Switzer-CARTY we pride ourselves in being extremely focused on both our customers and our employees which has translated into an industry-leading reputation for outstanding customer service and safety. In addition to contract school bus services and special needs transportation, we also offer budget-friendly bus rentals for private groups. We also specialize in upscale limousine style service with our complement of air-conditioned coach style party buses. These limo style party buses are perfect for weddings, corporate or other party events. Whether you need a bus for your school trip or a coach bus for your bridal party or company executives – we have a vehicle type to get you there safely and in style! The Toronto Branch is a full-scale and full-service school bus operation. For employment opportunities including office administration/dispatch, bus technicians, and bus drivers please apply to join our team! 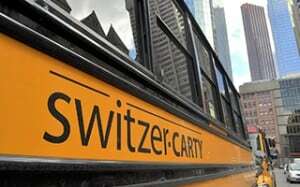 Switzer-CARTY is servicing the west end of Toronto specifically in the Etobicoke area. Our Toronto Management team brings over 15 years of school bus operating experience. Brian has lead numerous branch operations with high levels of customer and employee satisfaction ratings. He is happy to accept your call and discuss our services and how they can help your organization. Whether a one-time charter or contract school transportation services, we’re here to help. Contact us today! Switzer-CARTY firmly believes that leadership counts in developing into an industry leading organization. Hiring the right people at all levels is critical. We have been successful in attracting the best employees in the business and their incredible focus on customer service has resulted in Switzer-CARTY being the fastest growing privately owned school bus company in Ontario. Switzer-CARTY is currently accepting resumes and applications for dispatchers, mechanics, safety officers and drivers. Are you interested in joining Switzer-Carty Transportation and becoming part of a Team that cares about its people and customers? If so, please apply here and we will follow up with you!